Claudia Maquin, mother of Jakelin Caal Maquin, a 7-year-old girl who died in U.S. custody, stands with her other children outside her house in Raxruha, Guatemala, Dec. 15, 2018. The 7-year-old Guatemalan migrant girl who died in U.S. custody this month was inseparable from her father and had looked forward to being able to send money home to support her impoverished family, relatives said Saturday. Nery Caal, 29, and his daughter Jakelin Caal Maquin were in a group of more than 160 migrants who turned themselves in to U.S. border agents in New Mexico on Dec. 6. Jakelin developed a high fever and died two days later while in the custody of U.S. Customs and Border Patrol. "The girl said when she was grown up she was going to work and send dough back to her mom and grandma," said her mother, Claudia Maquin, who has three remaining children, speaking in the Mayan language Q'eqchi' and betraying little outward emotion. Corn stood behind her palm-thatched wooden house, and there were a few chickens and pigs in the yard. The mother was dressed in a traditional blouse and held a 6-month-old baby in her arms. A family photograph at the house showed Jakelin smiling and looking up at the camera, wearing a pink T-shirt with characters from the cartoon series Masha and the Bear. Deforestation to make way for palm oil plantations has made subsistence farming increasingly hard for the 40,000 inhabitants of Raxruha municipality, where the family's agricultural hamlet of San Antonio de Cortez lies in central Guatemala, local officials said. That has spurred an exodus of migrants. Elvira Choc, 59, grandmother of Jakelin Caal Maquin, a 7-year-old girl who died in U.S. custody, stands outside her house in Raxruha, Guatemala, Dec. 15, 2018. Setting out on Dec. 1, Caal and his daughter traveled more than 2,000 miles (3,220 km) so Jakelin's father could look for work in the United States, said her mother, who learned of the girl's death from consular officials. Almost 80 percent of Guatemala's indigenous population is poor, with half of those people living in extreme poverty. The mayor of San Antonio de Cortez described the Caal family as among the worst off in the village. Mayor Cesar Castro said in recent months that more and more families were uprooting to try to reach the United States, often selling what little land they owned to pay people traffickers thousands of dollars for the trip. Jakelin's death has added to criticism of U.S. of President Donald Trump's hard-line immigration policies from migrant advocates and Democrats in the U.S. Congress. The U.S. government defended Jakelin's treatment, and said there was no indication she had any medical problems until several hours after she and her father were taken into custody. 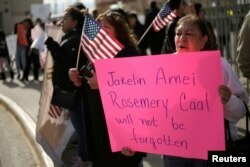 A woman holds a placard for Jakelin Caal Maquin, a 7-year-old Guatemalan girl who died in U.S. custody after crossing illegally from Mexico to the U.S., during a protest held to demand justice for her in El Paso, Texas, Dec. 15, 2018. Jakelin's uncle, Jose Manuel Caal, said he had heard she was ill before she died, but he had expected her to recover. "The girl's death left us in shock," he said. The family hopes the girl's father can remain in the United States. A Guatemalan consular official told Reuters on Friday that Caal told him he had crossed the border planning to turn himself in to U.S. authorities, and would try to stay. Record numbers of parents traveling with children are being apprehended trying to cross the U.S. border with Mexico. In November, U.S. Customs and Border Protection (CBP) officers detained 25,172 members of "family units," the highest monthly number ever recorded, the agency said. Caal remains in the El Paso, Texas, area, where his daughter died after being flown by helicopter to a hospital there for emergency treatment when she stopped breathing.